Can you really consider finding a source of power to charge your smartphone a survival skill? For some people, not having a working phone is more dire than not having clean drinking water. So if you find yourself in the great outdoors without an outlet, a little ingenuity can turn random junk into a working hydro-electric generator. 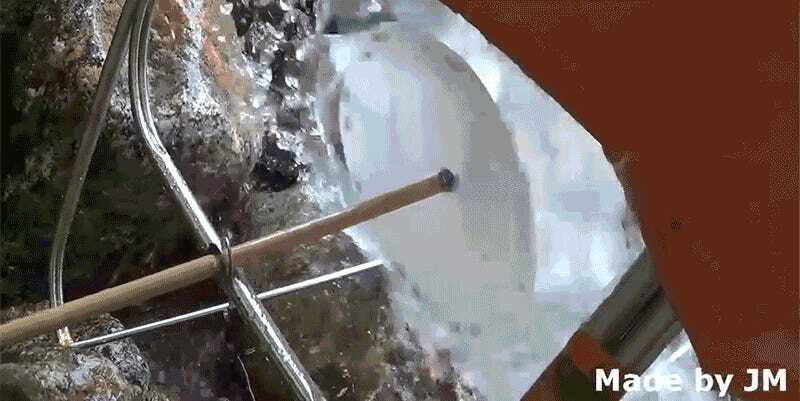 YouTube’s Thomas Kim clearly wasn’t in a survival situation when he MacGyver’d some water bottles, plastic plates, metal pipes, and other materials into this generator—after all, he had plenty of free time to film the whole thing. But his contraption was also able to power LED lights, and presumably other electronics, to make his time in the woods even more comfortable.